Knoxville, Tennessee is located in the EST (Eastern Standard Time) time zone, UTC/GMT -5 hours. The sunrise is at 07:07 and the sunset at 17:31 for the moment of the mid- November 2018. The length of the day is 10 hours 24 minutes. Greenwich, UK is 5 hours ahead of Knoxville, Tennessee. Knoxville, Tennessee is located in the area of a humid subtropical climate zone. Therefore, summers are the warmest period of the year with the average temperature reaching the mark of 25.8 °C or 78.4 °F in July. There are approximately 36 days a year when the temperature exceeds 32 °C or 90 °F. Winters are quite cold and less stable regarding the temperature changes. Thus, an average temperature might reach a mark of 3.4 °C or 38.2 °F in January, which is usually the coldest month of the year. 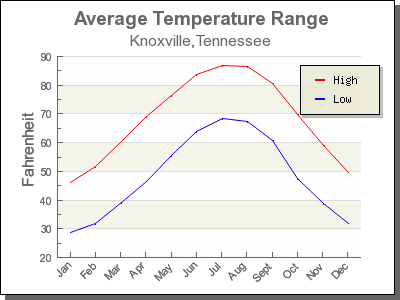 The highest temperature recorded in Knoxville was filed on June 30 and July 1, 2012, when the temperature reached 41 °C or 105 °F. The lowest temperature, in turn, was recorded on January 21, 1985, when the temperature reached −31 °C or −24 °F. There is not a significant amount of precipitation appearing in Knoxville. Thus, the rainfall level might reach 1.220 millimeters annually, and the snowfall level is approximately 17 centimeters per year. The record snowfall level was recorded on February 13, 1960, when the snowfall level reached 44 centimeters. However, the snowfall rarely occurs during the months rather than January and February.